Nominated for a whopping 10 Tony Awards and grossing more than $1 million each week, Wicked is this year's Broadway smash! A prequel to the all-American classic The Wizard of Oz, this new musical is a character study of Elphaba and Glinda, school roommates who grow up to become the Wicked Witch and the Good Witch, respectively. We are very proud to offer two songbooks featuring this delightful music: a Vocal Selections book which contains the vocal line with piano accompaniment (00313268), and a Piano/Vocal Selections book, in standard piano/vocal format with the melody in the piano part (00313267). 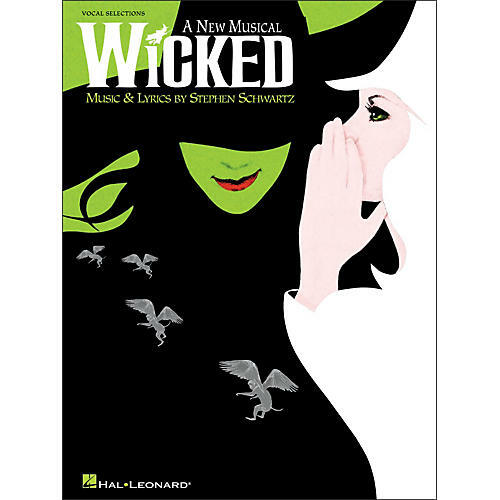 Both songbooks feature a special section of color photos from the production, a note from composer/lyricist Stephen Schwartz, and these fantastic tunes: As Long as You're Mine • Dancing Through Life • Defying Gravity • For Good • I Couldn't Be Happier • I'm Not That Girl • No Good Deed • No One Mourns the Wicked • One Short Day • Popular • What Is This Feeling? • The Wizard and I • Wonderful.